(Nanowerk News) US astronomers looking for life in the solar system believe that Europa, one of the moons of Jupiter, which has an ocean, is much more promising than desert-covered Mars, which is currently the focus of the US government's attention. "Europa is the most likely place in our solar system beyond Earth to possess .... life," said Robert Pappalardo, a planetary scientist at NASA's Jet Propulsion Laboratory (JPL) in Pasadena, California. "And it is the place we should be exploring now that we have a concept mission we think is the right one to get there for an affordable cost," he continued. "Europa is the most promising in terms of habitability because of its relatively thin ice shelf and an ocean ... And we know there are oxidants on the surface of Europa." 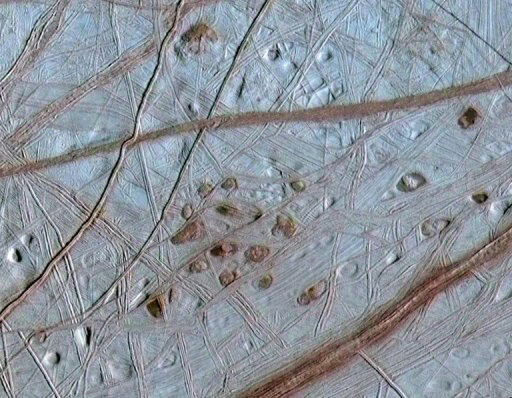 A NASA photo shows reddish spots and shallow pits peppering the surface of Jupiter's moon Europa in this view combining information from images from NASA's Galileo spacecraft 31 May, 1998. US astronomers looking for life in the solar system believe that Europa, which has an ocean, is much more promising than desert-covered Mars, which is currently the focus of the US government's attention. At the request of NASA, a proposed mission to explore Europa was revised to significantly reduce the cost, the scientist told the media on the sidelines of an annual conference of the American Association for the Advancement of Science (AAAS) underway here. As a result of this review, the JPL and the Applied Physics Laboratory at Johns Hopkins University in Maryland developed a new exploration project named Clipper with a total coast of two billion dollars minus the launch. Following the successful example of Cassini, a probe that explored Titan, a moon of Saturn, a spacecraft would orbit Jupiter and conduct numerous close flybys of Europa. "That way we can get effectively global coverage of Europa by doing many many flybys," Pappalardo argued. "And that can do outstanding science -- not quite as good as an orbiter, but not that bad -- for half the cost, which is two billions dollars over the life of the mission excluding the launch." If the plan is approved, Clipper could be launched by 2021 and take three to six years to reach Europa. By comparison, it takes six months to reach Mars. But NASA already announced at the end of 2012 that there will be no funds for the Clipper mission in the current atmosphere of budgetary cuts, he said. However, the space agency announced in December that it was sending to Mars in 2020 a new robot similar to Curiosity, a project that cost an estimated $2.5 billion. Curiosity, which arrived on the Red Planet in August 2012, is trying to find out whether life was possible on Mars in the past. Under the current plans of robotic exploration, after the arrival of the probe Juno to Jupiter's orbit in 2016 and its planned crash a year later, the United States will no longer have probes in the distant reaches of the solar system. NASA could, however, participate in a mission to Jupiter by the European Space Agency (ESA) called "Jupiter Icy Moon Explorer," during which a spacecraft is expected to arrive to its destination around 2030. Noting that Mars consumed most attention in the course of NASA's exploration of the solar system, Pappalardo said the agency should not ignore planets that have a high scientific priority. In his view, life could have existed on Mars several billion years ago, but Europa could have life today. "If Europa is the best place in the solar system after Earth to host life, Encelade (a Saturn Moon) is right up there as well," said Amanda Hendrix, a senior scientist at the Planetary Science Institute in Tucson, Arizona. "It has at least a subsurface sea, if not an ocean, and there is geological activity. "It has heat at the south pole and is ejecting water particles in a geyser and other components in the south pole plume. Europa was closely observed for the first time by the twin Voyager probes in 1979 and then, in more detail, by Galileo in the 1990s.